Second home of many members of the Rep. Situated next door to the Rep the Park Bar was the Reps bar . Used by the Members , and on show nights the audience . It had a bell which could be activated from the Rep to signal the start of the play. There was also a small off licence where cast members in costume and make up used to go for some Dutch courage prior to , and sometimes at the intervals of , a performance. The Park was origionaly called McTurks but the name was then changed probably being named after the football / rugby park which was at the end of the building in the above photo. It was for a time home to Clydebank Rugby Club after their games , as they had no club of their own. but the park has now been developed for housing. 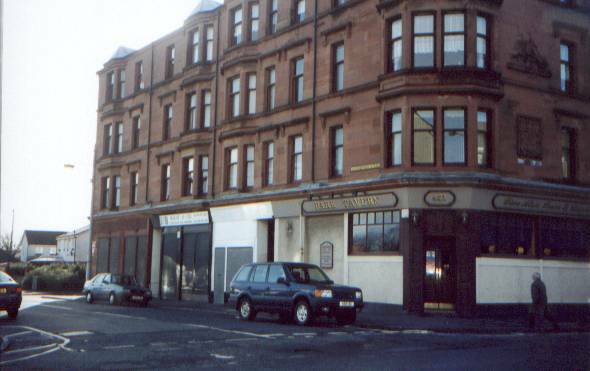 The origional Managaress/Landlady was Madge but the pub then changed hands and "mine host" was Gordon. Des the Barman is also fondly remembered for his wit and repartee by all who drank / or were drunk there.